Mrs. Ijeoma Ukachi Nwankwo is a 1984 Honors graduate of Pharmacy from the University of Nigeria, Nsukka. 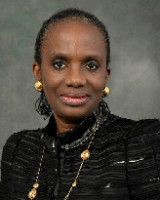 She joined the National Agency for Food and Drug Administration and Control (NAFDAC) in September 1994 and has worked across many Directorates of the Agency including Narcotics & Controlled Substances, Registration & Regulatory Affairs, office of the Director-General, Ports Inspection, Investigation & Enforcement and Drug Evaluation & Research. She has served on many committees of the Agency and has contributed immensely to the development and establishment of several policy documents of the Agency. She is vast and highly experienced in regulatory science of food and drugs. She was appointed Director, Drug Evaluation & Research Directorate on 1st January 2018. She is a member of the Pharmaceutical Society of Nigeria, International Pharmaceutical Federation and has passion for volunteer work, family and sports. Mrs. Ijeoma U. Nwankwo is married with children.